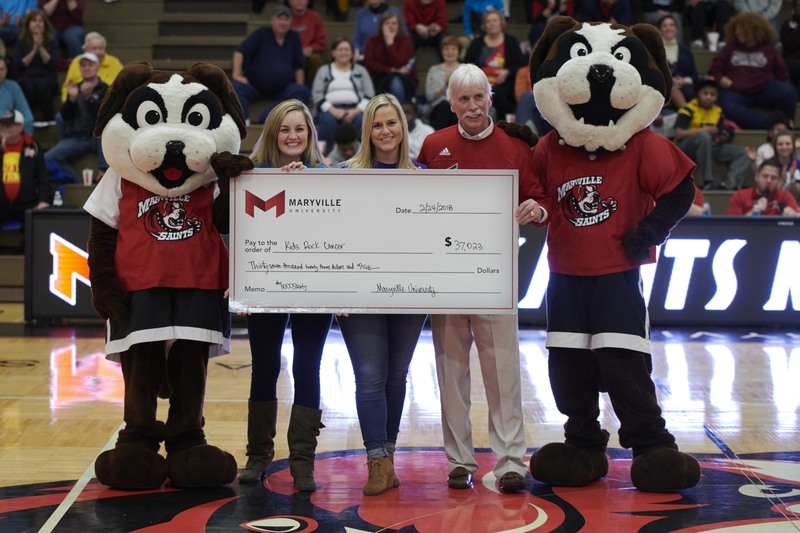 The #1000Saints event, held Feb. 24, rallied the Maryville community in support of the men’s and women’s basketball teams, while also raising funds for Kids Rock Cancer. The annual tradition calls for 1,000 fans—students, alumni, faculty, staff and friends—to pack Moloney Arena, home of Saints basketball, for a double-header. Nearly 1,400 fans were in attendance to see the men’s team win 79-71 over cross-town rival University of Missouri-St. Louis (UMSL). The women’s team fell 70-64 to the UMSL Tritons. Faculty, staff and students also contributed to Kids Rock Cancer by making donations during lunch during the week prior to the event. 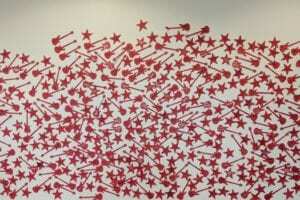 As donations were collected, names were written on red guitar and star cut-outs and displayed on a wall in Gander Dining Hall. Kids Rock Cancer, Maryville’s innovative music therapy program, helps children and teens successfully cope with the emotional challenges accompanying a cancer diagnosis by writing and recording a song. For more information, visit KidsRockCancer.org. View a video on Maryville’s #1000Saints Night tradition featured on 590 the Fan radio here.